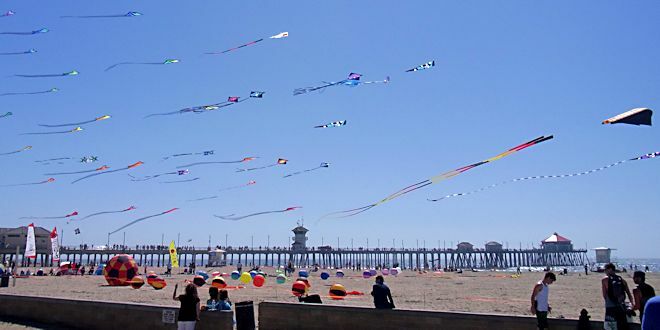 Here’s an interesting event you will want to add to your calendar if you like kites and spending the day at the beach: The Kite Connection will be hosting Kite Party 12 on March 8-9, 2014 on the sand to the right of the Huntington Beach Pier. I stumbled across this event during a bicycle ride a couple years ago and I was so impressed by what I saw that I try to go each time they hold another. Kite Party is a “non-festival” which features some of the best kite builders, fliers, and flying teams in the country and the sky will will full of their exotic colorful kites, often flying in precise multi-kite formations. It’s a good opportunity to see the latest kite innovations and watch some excellent fliers do amazing stunt routines, both individually and as teams. Only registered participants can fly in the Kite Party event, but open flying is allowed outside the roped-off area as long as it doesn’t interfere with the Kite Party flying. You can also purchase kites of all types at The Kite Connection which is located on the Huntington Beach Pier. For more information you can visit the Kite Party webaite at www.kiteparty.com.